Does anyone not know the name Picasso? Based on sales of his works at auctions, he holds the title of top ranked artist according to the Art Market Trends report. He was also a prolific artist with estimates of 50,000 works of art producedin his lifetime. (This includes paintings, drawings, sculptuers, etc). Pablo Picasso worked up until the day he died at age 91; literally painting till 3 am on Sunday, April 8th, which was just hours before his death. 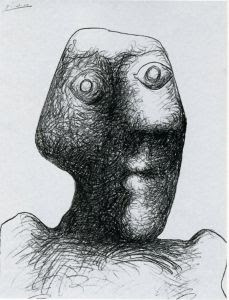 His last well known self-portriat was done a little less than a year before his death, entitled Self Portrait Facing Death (June 30, 1972). The piece is done with crayon on paper, and took several months to complete. 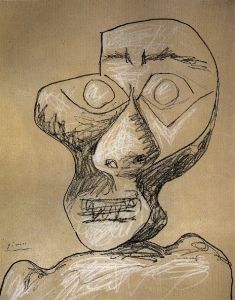 A friend, Pierre Daix, tells of his memory of the piece on a visit to Picasso, "[Picasso] held the drawing beside his face to show that the expression of fear was a contrivance." Then on another visit 3 months later, Pierre recalled that the harsh colored lines were even deeper, and Pierre writes, "He did not blink. I had the sudden impression that he was staring his own death in the face, like a good Spaniard"
There is much comentary about this piece. People talk about the fear of death Picasso had and how terrified his eyes look. They comment on the deep lines of age, and the work symbolizing Picasso's confrontation of death. Interestingly, as I researched this post I found a complete catolgue of Picasso's works, in sequential order. It appears that just days prior and days after the piece above, he did several other self portraits. In all his works through the next months before his death, I saw no further self portraits, these above were done in a burst, as if when done with these, he was done contemplating self and death. 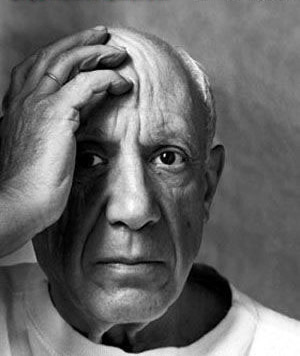 Picasso's death itself was sudden, waking on the morning of the 8th with an inabilty to get out of bed, calling for his wife, and dying 10 mins later. His cause of death was likely a heart attack with complications from heart failure. I am happy to have stummbled upon the other portraits, giving us different glimpses of the idea of himself. Having such different works done in such a short time, gives testament to the complexity of all of our own self concepts. Just as I see the feelings of chaos, fear and acceptance in the works above, my own patients contemplating death can bounce from chaos, fear and acceptance sometimes in the span of a few hours. It was ok but i would have liked more inormation about what it shows. very interesting, but where Is it now?